Brokerage now just $10 per trade under $1000^. 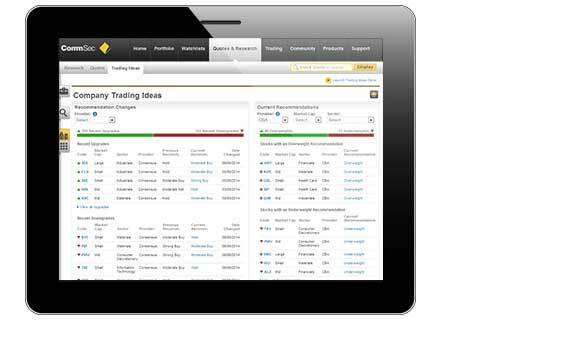 At CommSec, we’re committed to helping you trade with confidence. Below is a reminder of some of the great benefits you can expect as a CommSec customer – helping you get going with even more value. 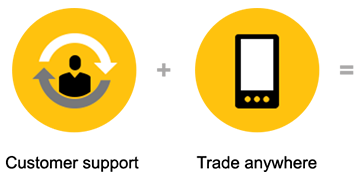 Manage your portfolio, with the help of CommSec’s wide range of research and trading tools. Act on opportunities quickly, with the assistance of CommSec’s sophisticated charting tools. Find trading inspiration, or maybe just get a second opinion, with insights from industry experts. 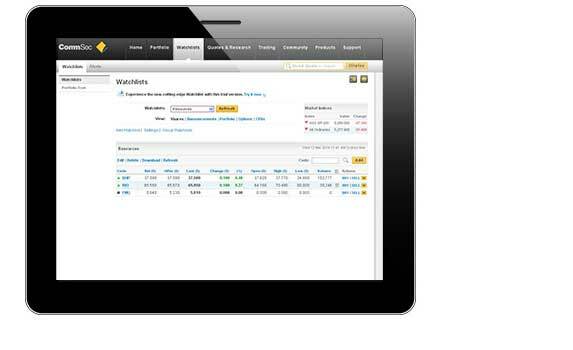 Place trades without having to constantly monitor the market, using free conditional orders. You can also stay informed with our free market alerts1. Get relevant information at a glance, using watchlists to keep an eye on companies of interest. 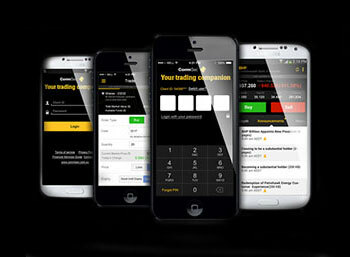 Manage your investments, trade on the go and stay on top of the market - whenever you like, wherever you are - with the free CommSec Equities app. Make more informed trading decisions, with the help of our cutting edge research platform. Featuring research from Goldman Sachs and Morningstar, it’s free for all our customers and offers an expanded range of tools and simply displayed information in an easy-to-navigate site. You can also get live commentary and daily updates from our very own industry experts. Stay in the know, with the help of real-time share and market prices. Diversify your portfolio, by trading in over 25 international markets. Access timely opportunities with non-traditional investments, by subscribing to our IPO & new issues notification service. 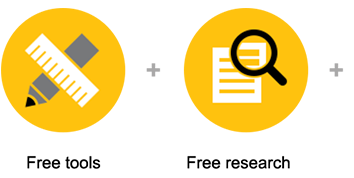 Boost your investment knowledge with Learn, or exchange ideas with like-minded investors in CommSec Community. Take advantage of investment opportunities when they arise, by trading up to $25,000 worth of stock without an initial cash deposit2. And if you have any questions, or would like some help with placing a trade, we’re here to help. You can contact our dedicated Client Service Team by phone, Twitter or online, 8am to 7pm (Sydney time), Monday to Friday. 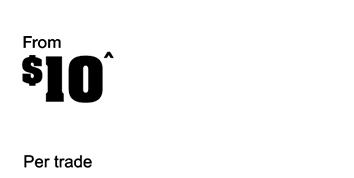 The images shown above are examples only and are subject to change. Security illustrations are examples only and not a recommendation to buy, hold or sell. ^ For trades under $1000. To be eligible, you must trade online, be CHESS Participant Sponsored with CommSec and settle your trades through either a Commonwealth Direct Investment Account (CDIA) or a CommSec Margin Loan. 1 Alert data is provided for your information only and should not be relied on for taxation, investment or any other purposes. Alert data is provided by Markit Digital and Six Telekurs and is not verified by CommSec. CommSec does not make any representation or warranty as to the timeliness, reliability, accuracy or completeness of the material contained in alerts, nor does it accept any responsibility arising in any way for errors in, or omissions from, that material. 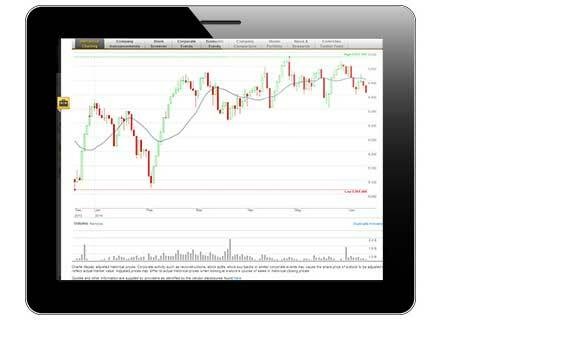 Markit Digital uses data sourced from ASX TradeMatch only.